With straight lines and quality finishing, the PURMO Compact radiators is a sleek asset to both traditional and contemporary interiors. 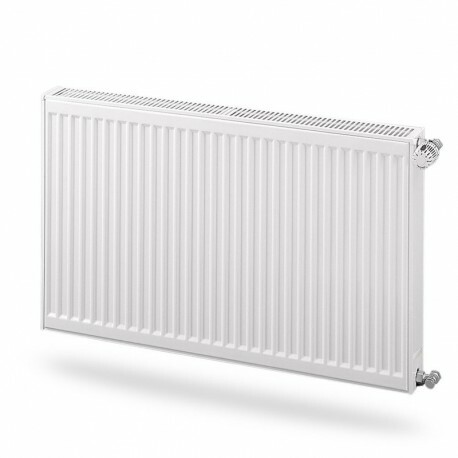 The radiator is hardwearing because of its smooth and solid scratch resistant coating, and easy to clean. All PURMO panel radiators Compact are produced with a cold rolled, high quality steel plate 125mm thick according to EN 10130. Certain models have vertical profiles of 33 mm or 50 mm. Other models are provided with a flat front. Testing pressure 13 bar. Ramo Ventil + Vertical : 8 bar. Working pressure 10 bar. Ramo Ventil + Vertical : 6 bar. Heat outputs were measured according to the EN 442 standard, with a water temperature of 75/65 °C and a room temperature of 20 °C (delta ∆T=50).